From 1993 to 1997, Sonia Satra starred as Lucy Cooper on the CBS daytime drama Guiding Light. Lucy eventually left Springfield behind after marrying Alan-Michael Spaulding (played by Rick Hearst, then Michael Dietz). After leaving Guiding Light, Satra guest-starred on Baywatch and played Barbara Graham on ABC's One Life to Live, and went on to appear in a number of movies and TV series including Hyacinth, Soldier of Fortune, Pride & Loyalty, The Drum Beats Twice, Redum and The Men Who Built America. Today, the multi-talented Satra has added certified life coach, fitness instructor, and award-winning motivational speaker (she was president of the National Speakers Association – NYC!) to her list of accomplishments. She also recently co-hosted a new talk show, Healthy Lifestyle with Eraldo on WMCN-TV. She had fun getting some healthy cooking tips while interviewing Dina Deleasa-Gonsar, known as "The Dish it Girl." We Love Soaps spoke with Satra about her journey, including the lessons learned from her time on soaps. "Where I am today is absolutely a combination of everything that I've done, all sort of built on each other," she says. "In terms of acting, that's where I started to learn the whole mind-body thing. And the discipline of that life is completely applicable to having your own business. From a mindset perspective, and a mind-body perspective, and a work ethic perspective, it's all been really helpful." With everyone's busy lives on both coasts, it's not always easy to keep in touch with former co-stars. But earlier this year at the annual Stars & Strikes charity event, Satra reconnected with former Guiding Light actors Michael O'Leary (Rick), Elizabeth Keifer (Blake), Ron Raines (Alan), Grant Aleksander (Phillip), Kim Zimmer (Reva) and Jerry verDorn (Ross). "It was fun to see everybody again," she says. "And I do speak to Rick [Hearst] every once in a while. I'm sure if I was in L.A. we would see each other more." Satra is also founder and creator of the new fitness program, Moticise, which combines aerobic exercise with mindset tools, like visioning, affirmations, and goal-setting, to help you tone your body, focus your mind, and create the life you’ve always wanted. Sonia Satra recently co-hosted Healthy Lifestyle with Eraldo. "While I was pursuing speaking, I came up with these women's empowerment adventures," she explains. "I've always liked the outdoors, and thought it would be cool to put that together with a life coaching workshop." Moticise Adventures are a series of workshops, in which Satra pairs a life coaching workshop with an outdoor adventure. A recent one in New York was The Power of Letting Go: Trapeze Adventure. Previous adventures have also included kayaking to the Statue of Liberty and climbing a rock wall. "When you work out and get your heart up, a protein actually gets released in your brain that that creates new neural pathways," she says. "You can actually rewire your brain." Satra hosted an event last week at Athleta on the Upper East Side in New York City. 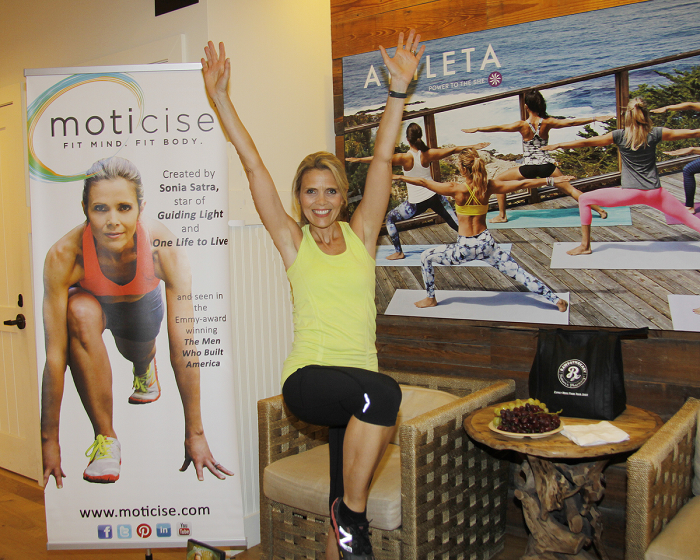 Attendees got to meet Satra personally, try out the workout, and shop Athleta fashions. Satra still loves to act, and appeared in the National Geographic Channel docu-drama American Genius in June. "Once you get it in your system, you never get it out," she admits. For more information on Sonia Satra & Moticise, visit www.moticise.com.